Every year since 2012, we’ve spent some time after the season looking back at those that wore the Birds on the Bat. Whether it’s a bit player that got into just a couple of games or someone that played almost every day, we’ll look at their stats, their positives, their negatives, and grade them based on what we would have expected from them. The stat line is from their time in St. Louis, though splits and other numbers may include time with other teams, if applicable. Think of this as like the players packing up their locker and then seeing Mike Shildt before they head off for the winter, or in this case talking with Bill DeWitt. Once again, our great header work comes to us from cardinalsgifs, who continues to be a master. 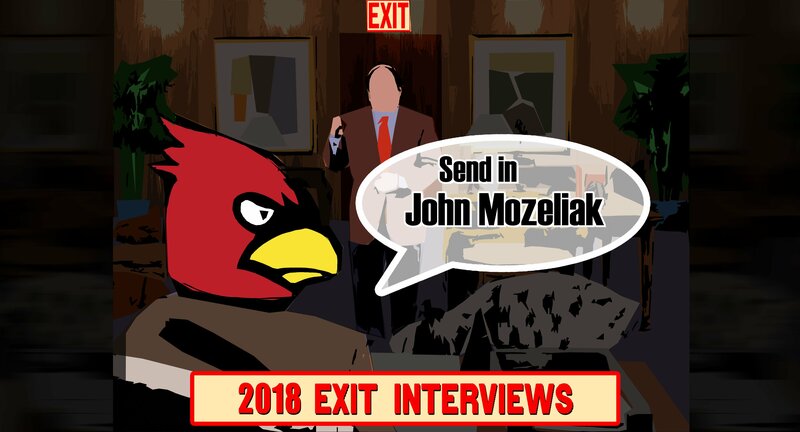 Overview: For some, the fact that John Mozeliak finally made a change at manager would be enough to give him an A and call it a day. (And I should clarify, while we are using Mo in this interview, this really encompasses the entire front office because sometimes it’s tough to know exactly who is doing what sometimes.) That definitely was the biggest transactions of the year, but you also have to give him some credit for bringing in Miles Mikolas, which may have been the MLB transaction that had the biggest bang for the buck over the last offseason. The trading deadline was more active this year than it has been in the past, though the results were pretty mixed. Luke Voit thrived in New York but the Cardinals did get Giovanny Gallegos, who could play a part next year. Tommy Pham going to Tampa Bay was a surprise, but Genesis Cabrera could make that a much better deal in the near future. The front office also should get credit for remaking the bullpen on the fly, without which that August run wouldn’t have been possible. Outlook: Obviously, the front office is going to come in for a lot of heat and some of that really is justified. The Josh Donaldson miss seems to be one that the club fell into their old habits of not doing enough to make a deal, but it’s hard to know what the offer was, how much the pull of Atlanta made a difference, etc. The obvious way to remake this team was Donaldson and Bryce Harper, but the Adam Wainwright contract shows that there’s a streak of creativity in this group. All that said, the next few weeks are huge for Mo and company. If they have nothing significant to show for this winter, all the pressure turns to them and it is completely justified. If they “just” get Paul Goldschmidt in a trade, there’s still a lot of criticism there. Hopefully we’re talking about how this grade needs to be bumped up by Christmas, not dropped down.